John Bunyan was first imprisoned in 1660 for twelve years in the county jail during the reign of King Charles II, the grandson of King James. After a short release he was imprisoned again for a brief time in the city gaol on the river bridge. During these years Bunyan was writing and planning five major works. His first was Grace Abounding to the Chief of Sinners, completed during his first imprisonment. During his second imprisonment in 1677 he completed his most famous work, Pilgrim’s Progress. In 1680 he wrote The Life and Death of Mr. Badman, an indictment of the social evils of England. This was followed by The Holy War in 1682, and then the second part of Pilgrim’s Progress in 1684. 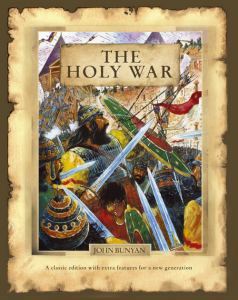 The Holy War is an allegory somewhat like Pilgrim’s Progress and many like it better. Its types and allegories are much more direct and usually easier to follow. The holy war is fought over a city called Mansoul which is owned by King Shaddai but has been taken over by Diabolus, a mighty giant. The city has five gates in which the giant took the city: Ear-gate, Eye-gate, Mouth-gate, Nose-gate, and Feel-gate. Those citizens who were overcome by the enemy are Mr. Resistance, Lord Will-be-Will, Mr. Recorder, Captain Resistance, Lord Innocency, and many others. They either become traitors and change sides or are replaced by such men as Mr. Vile-affection, Mr. No-truth, and Mr. Hate-reproof. The war begins as King Shaddai decides to retake the city of Mansoul by His son Emmanuel. This is done (a picture of salvation) and then the city is returned to its rightful and joyful condition. This, however, occurs only half-way through the book so that half of the war has to do with the proper defense of the city against Carnal Security and the Diabolonians. In the end Mansoul is secure and a Mr. Godly-fear is established as the castlegate-keeper. Other attacks are also repelled as the city remains secure.